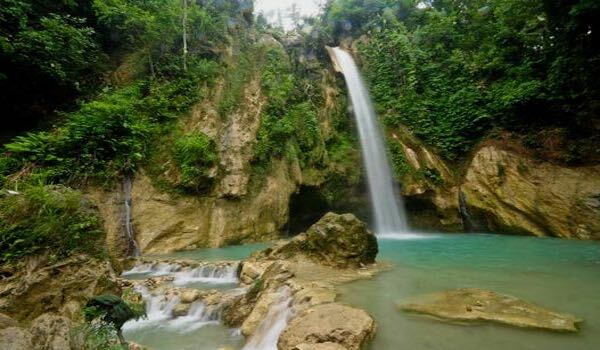 Beautiful Cancalanog Falls are located in Barangay Compostela Algeria, South Cebu. 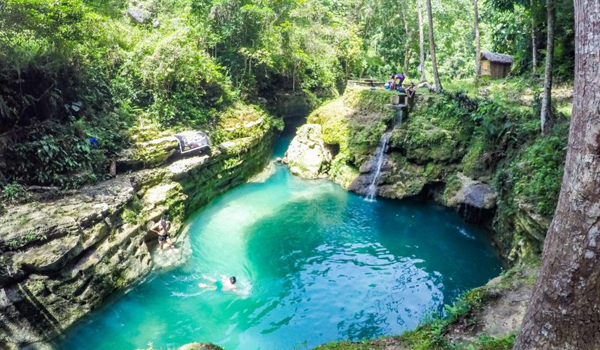 These enchanting Falls are a true hidden paradise. 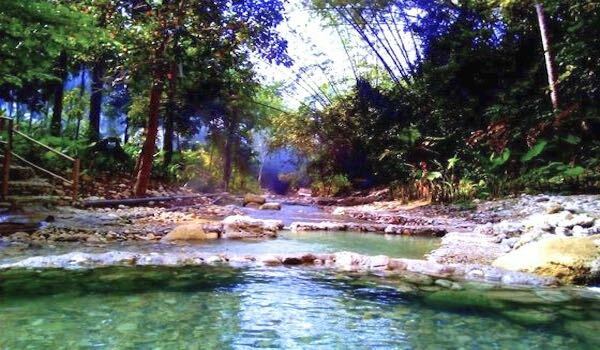 They form part of the Matutinao River system that leads to the famous Kawasan Falls. Crystal clear Turqouise waters with a natural deep basin, amazing rock formations not to mention the stunning back drop scenery. One for your bucket list when visiting Algeria. Kawasan Falls is one of the Philippines most famous waterfalls, and also one of the most famous in the world. 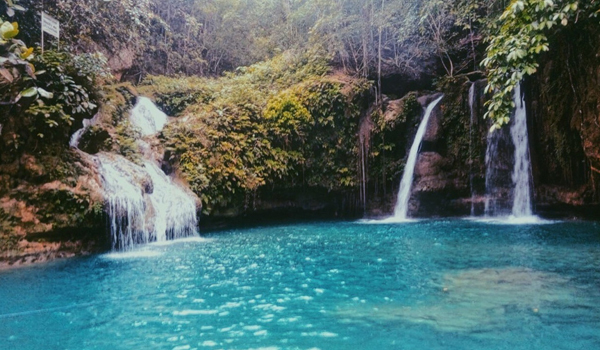 Kawasan Falls is known to be a tropical oasis with big bamboo rafts that can take you around the turquoise natural pool, and under the waterfall. Just 1-hour drive from Alegria. 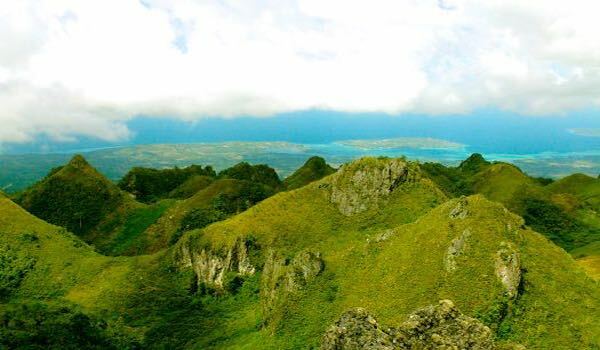 At 1,013 metres, Osmeña Peak is one of Cebu’s highest peak and is part of the Mantalungon mountain range it is a popular trekking and camping spot for both local and foreign tourists. It offers an amazing vantage point to view the surrounding mountains and sea on both sides, and the sunsets and sunrises are spectacular. Just 40 min drive from Alegria is home to the Fabulous Montaneza Falls which boasts four sets of waterfalls. The Montaneza River threads its way through a narrow ravine. 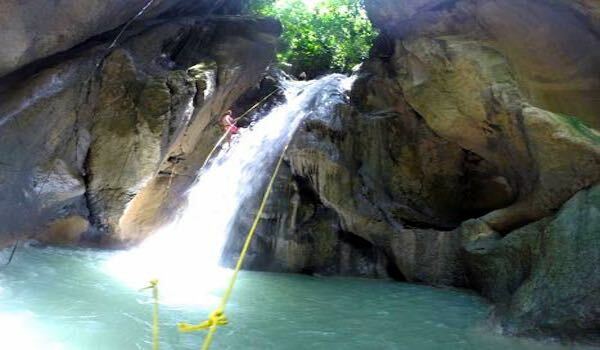 It is a perfect setting for an unforgettable canyoneering tour. Highest of the four waterfalls is approx 30 meters high which is almost as high as a nine-story building. Now this is a Waterfall! Unlike the other falls in Alegria, this one has the height, the power and a majesty befitting a waterfall. 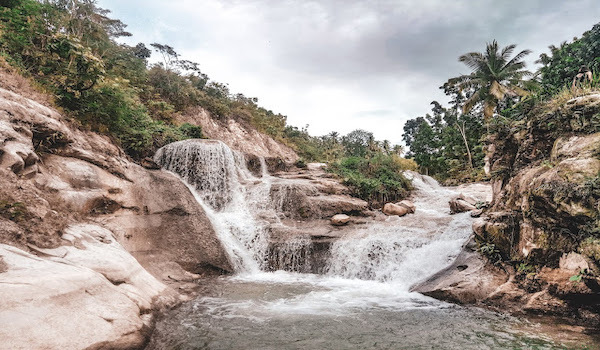 A trip to Alegria definitely calls for a visit, With the waterfall gushing forth, surrounded by green trees clinging onto the mountain, and vines hanging from above. 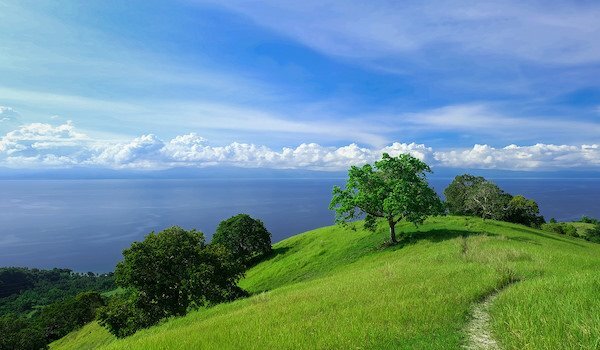 Stands on its throne around 700 meters above sea level, it provides the panoramic view of the vast ocean and the mountains of Negros Province. There are two trails. One is from Lumpan which has an estimated 2-hour trek. The other ace is the Legaspi trail, this one requires you to be in good physical and mental condition since it has a difficult and challenging trail, this will take 4 hours of trek. Sitting in the hot spring looking up at coconut trees with the last light of the day glowing in the sky reminds us how beautiful the world is, being with a group of friends at sunset star gazing into the heavens is probably the ultimate way to end the day. 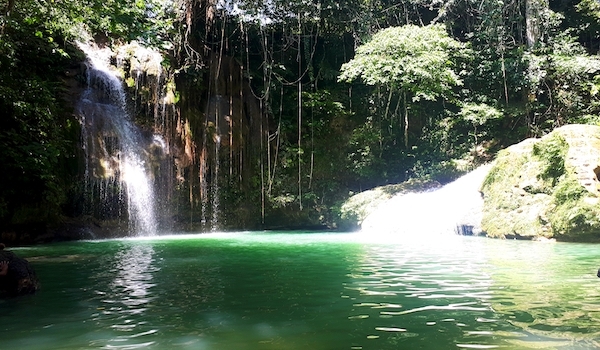 Cambais Falls is a multi-tiered waterfall situated in the scabrous mountain of Brgy. Guadalupe, Alegria Cebu. 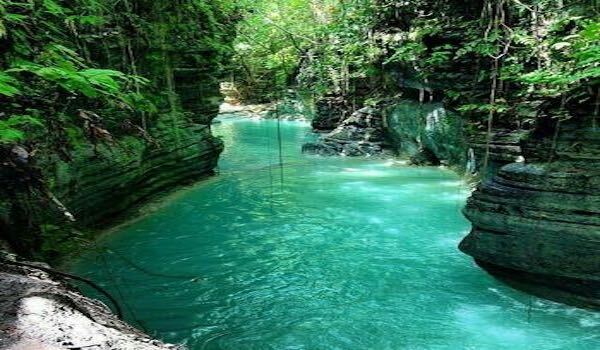 It is considered as one of the hidden treasures in Alegria since few tourist known this place. Upon reaching the first level, you are rewarded with a deep hue of blue to an emerald green and a wide catch basin perfect for swimming. Feel the exhilaration of jumping from cliffs and the calm of flowing waters of Kanlaob river as you do Canyoneering. The jumps will surely fuel an adrenaline rush. The cool fresh water will make you feel relaxed. This mixture of highs and lows is what makes it one of the most popular tourist spots in Cebu. This trip is for serious adventurers looking for their next unforgettable experience. Welcomes visitors through its huge gaping mouth boasts a large opening which enables a small amount of light to get through. Has a vast chamber with stalactites shaped like flowing waterfalls. The passageway from Cambusay leads to another opening which you have to trek to get to Salay caves. Moalboal is a small town in Cebu known for its sea paradise beauty, captivating a lot of worldwide tourists. But only a few knew that this place branded with dive shops, resorts, and beaches also have hidden treasures up in the mountains. It's about time to open the curtains of “Taginis Falls”. 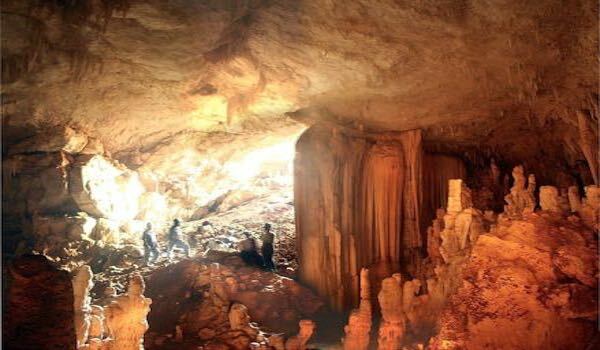 Salay Cave is one of the new and mysterious caves discovered in Alegria in the southern part of Cebu Province. 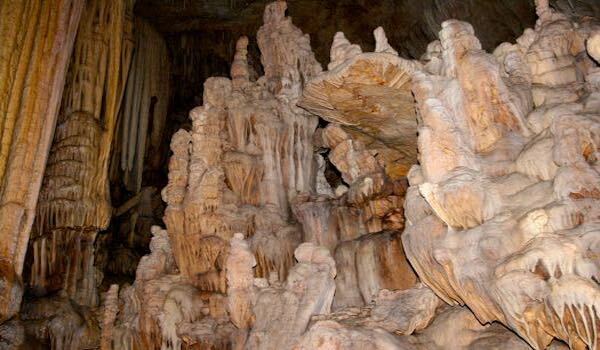 The opening is smaller compared to Cambusay but the interior of the cave boasts of huge stalactites and stalagmites which are preserved and protected. is not well-explored yet, and so one can still discover secrets and gems inside it.